The next time you step into Books Cellar, the shelves may have shifted, the books collection expanded and a new vintage-style telephone installed. ‘This place is a constant work in progress,’ avows owner Chang Hon Vie. After stepping in after its three-month anniversary, we can attest to there being room for improvement. It’s not that we weren’t won over by the retro-inspired armchairs, lamp-lit reading coves, foosball table, board games – and the prospect of taking the books (from $15) back home with you. 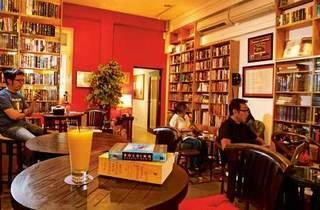 It was more that we weren’t swayed by the variety of books or the bar list. Specialising in horror and collectables, it was clear why Stephen King has a special place on this bar-café’s wall – two frames are dedicated to the godfather of horror writers. Books Cellar has possibly the biggest collection of King books on the island, alongside a smattering of fiction by female writers, fantasy and vintage RL Stines. 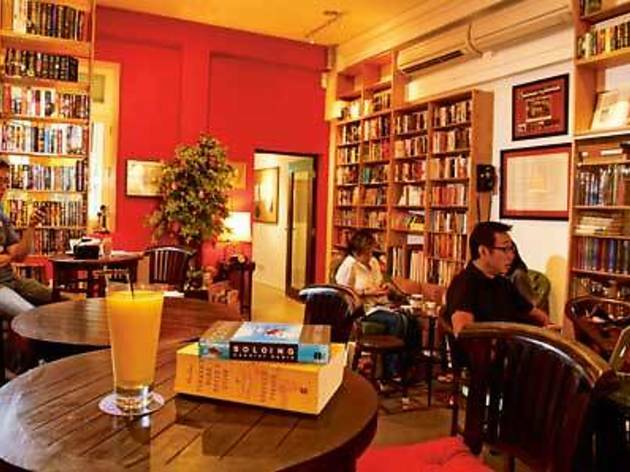 The bar menu helped a little: Books Cellar serves teas, Illy coffees, hard liquor, spirits, beers, champagne and Spanish wines only. The latter is part of a constantly changing menu and a preference of the owner. We thought the Solanes ’05 – a full-bodied red with distinct oak and cherry notes – would be perfect with a gripping thriller in hand. Wines by the glass from $7.50.